Fast Food News: McDonald's No Longer Gay-Friendly? McDonald's had long been supportive of equal rights for their homosexual customers and employees, but there are a couple of indications that their policy has changed. First, McDonald's has caved to the demands of the American Family Association (AFA), which has ended their boycott of McDonald's. The AFA called for a boycott of McDonald's in May after McDonald's joined the National Gay and Lesbian Chamber of Commerce (NGLCC) and indicated a support of gay rights. In accordance with the AFA's demands, McDonald's Vice-President, Richard Ellis, has resigned from the board of the NGLCC and the fast food giant has announced that they will not renew their NGLCC membership when it expires in December. Second, the incident at a Louisville, KY McDonald's in July, where 5 McDonald's customers were subjected to harassment based on their sexual orientation (they were called faggots by employees), has not been resolved to the satisfaction of the ACLU of Kentucky, the Fairness Campaign, UofL's commonGround, Lambda Law Caucus and others. Evidently, McDonald's corporate office (or any local management) has not responded to complaints filed by the ACLU, so the above organizations have scheduled a "We're not lovin' it" protest at the McDonald's where the incident occured. 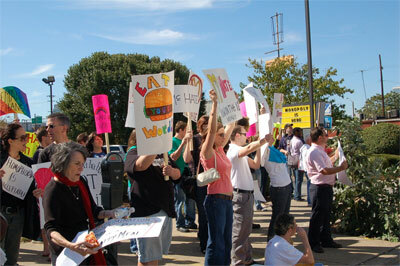 UPDATE: The protest took place at the McDonald's in Louisville today. Here are some comments from the Fairness Campaign and photos from the protest. 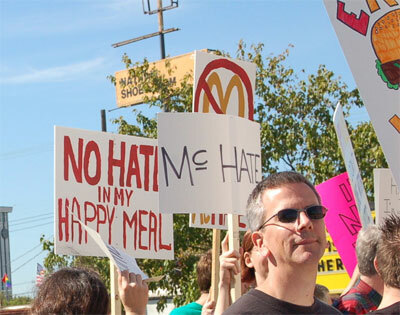 Carrying signs saying “Discrimination Don’t Belong in a Happy Meal”, “Homophobia Served Here”, “NOT Lovin’ It”, many protesters said they were shocked, hurt, and angered when they learned about the incident. UPDATE2: The ultra-conservative WorldNetDaily gloats about AFA's success in pressuring McDonald's to abandon their attention to civil and human rights.